While walking the streets of Lugang the other day, I observed women making a strange dish. I took some photos and asked my friend Chimei the next day what it was. 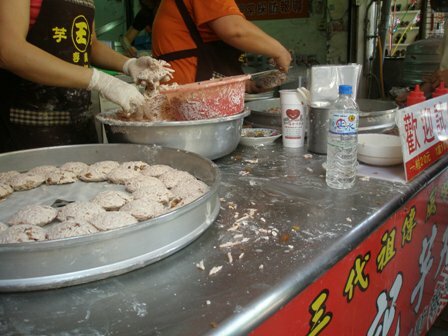 “Yu Tou Guo” (芋 頭 粿) was the result. Well, what is it, you might ask. 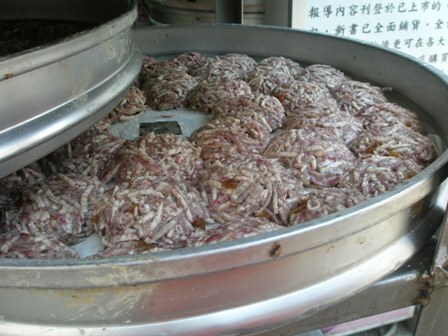 It seems Yu Tou Guo (芋 頭 粿) is made from taro, a tropical root vegetable. It is a kind of steamed taro cake, stuffed with some filling. I saw the women doing it, but did not ask because this stall was very busy. I will have to find out what the filling is made of. I did not dare buying one since it looked raw and not ready for consumption. All the buyers took it away, nobody ate from it on the spot. I will have to find out more and give it a try next time. PS: My Chinese dictionary gave me another combination for “Taro” in the simplified character form. But since I was in Taiwan, where the “full” Chinese characters are used, I guess that what Chimei scribbled on a piece of paper for me was correct. This entry was posted on Saturday, June 12th, 2010 at 10:12 am and is filed under food. You can follow any responses to this entry through the RSS 2.0 feed. You can leave a response, or trackback from your own site.